I figured before I posted any more public art, I'd better do some research and try to find out what's what by who. I got a public art brochure....and this one is not listed. Most of the pieces I've photographed aren't listed in the brochure. And I found one other piece in a different location than the brochure listed. It could have been moved. Artists: ask the city to update their public art marketing materials. I sent an email request for more updated info and haven't heard back. 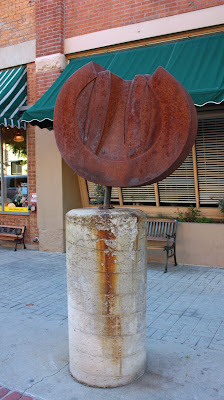 By the way, I think this piece looks like a tulip, and it can be found on 8th Street across from the Marketplace. Whatever it is, it looks pretty industrial. I find most public art to be downright ugly. Unfortunately, this one doesn't break that trend. However, I do still enjoy looking at them, just to see the originality of each piece. In that respect, this one sure doesn't disappoint!